The Club runs a preliminary tournament for the Grass Roots Golf Croquet Competition which is open to beginners without a handicap and higher handicappers with a Golf Croquet handicap of 9 and over. Winners proceed to the National Final to be held at Nottingham on 24th September. 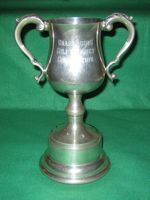 This national competition has been won by a Watford player three times in recent years - John Walker in 2005, Nick Archer in 2007, and Frances Skinner in 2009. Matches are played as 13-hoop games, Level Play. This competition has been cancelled due to insufficient entries.